War Memoranda probes the question “How do Americans remember war?” with soldiers’ portraits developed in the flesh of leaves, battlefield landscapes photographed using 19th-century technologies, and war poems of intimate reflection. “The real war will never get in the books,” Walt Whitman declared. In response, photographer Binh Danh and poet Robert Schultz have drawn upon Whitman’s poetry and prose, as well as striking historical portraits of soldiers, to create daguerreotypes, chlorophyll prints, cyanotypes, artist’s books, and poems that contemplate American wars past and present. This exhibition is offered concurrently with Afghan War Rugs: The Modern Art of Central Asia. 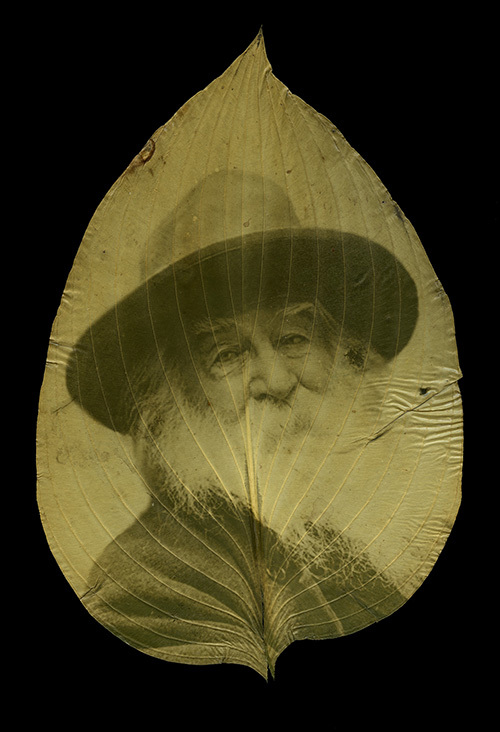 It was organized by the Taubman Museum, Roanoke, VA.
Pictured: Binh Danh and Robert Schultz, Walt Whitman, 1887, in Camden House hosta leaf. Chlorophyll print, resin. Courtesy of the artists. So the dead will always return in the books. And the bronze leaves of the great book lie still beneath the copse of trees. Join Annemarie Sawkins, co-curator of Afghan War Rugs, for a gallery talk in the exhibition. Meet in the Grand Gallery. This exhibition has been organized by the Taubman Museum of Art in Roanoke, Virginia. the Grant Holcomb Endowment Fund, the Kayser Fund, the Irving and Essie Germanow Fund, the Robert L. and Mary L. Sproull Fund, and an anonymous donor.